The Fender American Elite Stratocaster HSS Shawbucker MN Electric Guitar in 3 Colour Sunburst harmoniously combines classic Strat style with modern appointments to give you a universe of tonal versatility to explore. Fitted with a Shawbucker bridge pickup, this American Elite model boasts a generous low-end rumble, with a weighty midrange clout, and searing highs that are perfect for solos and choppy rhythm playing. As you'd expect from the team at Fender, this Strat has received all the love and attention afforded to every model, and you are guaranteed a sublime instrument that looks, feels, and plays like a dream. Since its introduction, the Stratocaster has been the model of choice for many legendary guitarists, across many different genres of music. The American Elite series models carry on the tradition with a sleek, contoured body shape with ergonomically designed curves the create a delightfully comfortable playing feel. The body is built using alder, a tonewood that has been favoured by Fender for decades thanks to its lightweight feel, and balanced timbre that allows for a nuanced output. The body has been treated to a 3 colour sunburst finish, which is coated in a protective layer of gloss polyurethane, thus guaranteeing resilience when handling changes in temperature and humidity - making it an ideal model for guitarists on the road. The American Elite series benefits from an updated neck profile, which takes the modern "C" profile and extends it along the length of the neck to a "D" profile at the neck heel, allowing your fretting hand to reach each and every fret with the greatest of ease. In order to improve intonation and sustain, Fender have designed a double-action truss rod that can be accessed via the heel-mounted spoke wheel adjustment at the base of the fingerboard. This allows you to adjust the neck precisely to improve performance. At the top of the neck the synthetic bone nut partners well with the deluxe cast/sealed locking tuners to uphold tuning integrity throughout the most enthusiastic of performances. Married to the single-piece maple neck is a sumptuous 22 medium-jumbo fret maple fingerboard, which is adorned with large pearloid dot inlays to guide your way. The back of the neck has been given a satin urethane finish to prevent tackiness or stickiness from impeding your hand as you move up and down the neck. The newly designed N4 Noiseless pickups are exclusive to the American Elite series, combining the best of both worlds - vintage tones with modern performance. Whether you're performing bright and lively country, hard and heavy rock, smooth blues chops - you get the idea -, the Noiseless pickups translates the textured timbre of the tonewoods without unwanted hum, so you're left with a pristine output. Control comes in the form of a five-way pickup selector switch that allows each pickup to be selected individually, or create neck/middle and middle/bridge combinations for a fuller tone. There is a master volume pot with a S-1TM switch, as well as a neck tone pot, and a middle and bridge tone pot with no-load circuitry that enables you to dial back the highs, without introducing unwanted low-end to the signal for a tighter-sounding output. 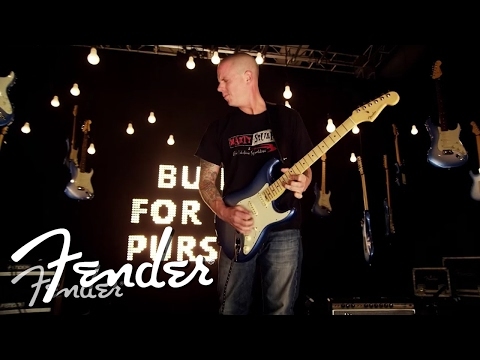 In the bridge position, Fender has fitted a Shawbucker pickup, which was designed by legendary pickup guru Tim Shaw. The beauty of the Shawbucker is that it adds a new dimension to the Strat's tonal offering. Alongside the sharpness and clarity offered by the neck and middle single-coils, you now have a warm, tight, and powerful driving warmth that sings when played cleanly, and roars when driven hard through your amp of choice. The Shawbucker also comes with a push-push passing lane switch that engages the bridge pickup and bypasses the tone controls to offer a huge output. The body is fitted with the 2-point deluxe synchronised tremolo with pop-in arm, which creates a seamless connection between the strings and body for optimised intonation and sustain, as well as guaranteeing smooth vibrato control. Neck Profile Compound Back Shape, Modern "C" to "D"